I read the paperback edition of this book; a clothbound edition was published in 1994. My first impression is that it is one of the essential books; no collection of baseball books should be without it. It did for me what anthologies are supposed to do: it sent me out looking for more writing by the writers it included. And there's a two-page "bibliography" that might be more accurately described as suggestions for further reading. 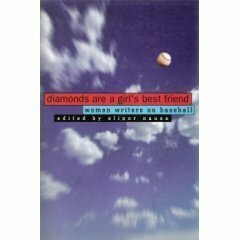 Elinor Nauen in her introduction promises that Diamonds will bring "together poems, essays, and fiction that tell of women's experiences in and around baseball, from consuming longing to distaste, from a lifetime as sister, daughter, or wife to short stops at a ballpark." Nauen suggests three ways baseball inspires "writers, in particular women[.]" First, there are all the reasons any writer chooses baseball as a subject: It's beautiful, absorbing, a soap opera that gets more interesting the more attention you pay. Second, a baseball work can be about baseball and "about" anything else. The leisurely pace of a game allows writers the space to deal with any issue, big or small: birth or death or politics. Third, and probably most relevant to Diamonds, baseball is played on the fields of the imagination as much as on the diamond, and these fields don't require physical strength or grace. Anyone who pays attention may write brilliantly or accurately, may have a terrific insight or theory (xii-viii). Naturally, the selections are divided into three sections: "Coming to the Plate," "Why We Love It," and "Analysis of Baseball." I found three kinds of treasures in this anthology: a selection of woman writers from the earlier years of the twentieth century, a collection of insights about the game, and some absolutely first-rate pieces of writing. I am happy to have been acquainted or reacquainted with such writings on baseball as those of Edna Ferber, Lucy Kennedy (a selection from The Sunlit Field), and S. W. M. Humason. Then there are the writings that Nauen refers to as "three selections from Baseball magazine" (xiii, I wished for more specific references): Mabel Hite's "On Just Being a Fan," Lulu Glaser's "The Lady Fan," and Ina Eloise Young's "Petticoats and the Press Box." Hite writes words we can all identify with: "the more I come to know about the game, the less I find I know." Here are a few of the specific insights that particularly struck me. Jean Hastings Ardell remarks of baseball in New York City prior to 1957 that "New York's crosstown baseball rivalries had given the city a sense of intimacy. Now that was gone" (77). Of Red Barber, Barbara Grizzuti Harrison says "he never said a careless word" (104). Carol Tavris writes that "there is no artificial nonsense of fake time, time-outs, overtime, and the like...Baseball lasts as long as it takes. Like life, like love, baseball exists in real time" (124). In the same vein, Eve Babitz writes "the tension in baseball comes in spurts between long waits where everyone can forget about it, a perfectly lifelike rhythm" (146). Finally, there is this from Lulu Glaser, that women "have the high nervous temperament and the quickness of perception that go to make up a good ballplayer" (172). manicured, safe, "scene in an Easter egg,"
Others will have their own favorites. Like all good anthologies this is just the tip of an iceberg.